(For a look at the Best & Worst Films of 2016, go here). "Just when I thought I was out, they pull me back in." That classic line is uttered by Al Pacino as Michael Corleone in 1990's The Godfather: Part III, but truthfully, it can easily be muttered by any audience member who happens to catch Live by Night, Ben Affleck's warmed-over plate of gangland goulash. 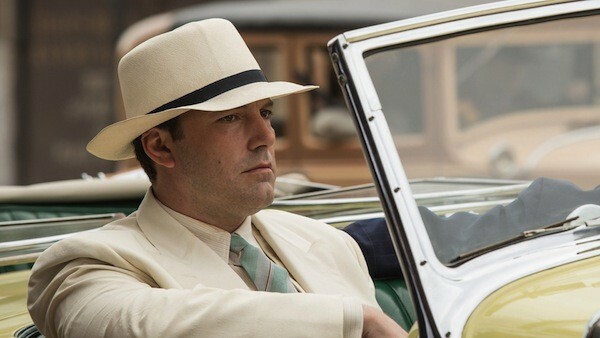 Live by Night marks Affleck's first project in the director's chair since his 2012 Best Picture Oscar winner Argo, and he also tackles the roles of writer, producer and star. The movie is based on the novel by Dennis Lehane, and that largely explains its appeal to Affleck, whose first (and, by my reckoning, best) film as director was 2007's excellent adaptation of Lehane's Gone Baby Gone. But Affleck's literary loyalty comes at a price, since Live by Night emerges as the weakest of his four directorial at-bats to date. Technically, the picture can't be faulted: It's a gorgeous production, meticulously put together by a team of seasoned Hollywood vets. This assemblage includes cinematographer Robert Richardson, who frames the saga in expansive and immaculate ways that seek to enhance the mythmaking (Richardson won a trio of Oscars for similar approaches on Hugo, The Aviator and JFK). Only in this case, the text can't keep pace with the illustrations. There's nothing inherently wrong with the story, which centers on Joe Coughlin (Affleck), a Boston mobster who's sent to Tampa to oversee operations and finds himself tangling with rival gangsters as well as the local Ku Klux Klan. But there's also little that's fresh, with Affleck dutifully following a dog-eared playbook that's been in rotation since the days when James Cagney would periodically gun down Humphrey Bogart. Select vignettes add some flavor — a sit-down with a Klan flunky leads to an extremely satisfying denouement — but nothing can overcome the implausibility of its leading character, a guy who seems entirely too sweet to be involved in such a nasty business. Affleck brings his usual stoicism (the less charitable would say rigidity) to the role, but that only adds to the dilemma. It's hard to accept this brooding anti-hero as one of the GoodFellas when there's an unshakable feeling that he's apt to whip out his Batman threads at any given moment.